Product description: Here’s a case of two well respected outdoor companies – Matador and Sawyer – coming together to create one handy new product, the world’s first collapsible hydration pack. Matador, of course, is famous for its lightweight yet strong gear; Sawyer makes water filters among other things. Their joint effort is an 18-by-11-by-2-inch pack made of Cordura material. It weighs just 17 ounces, yet has an 8-liter main compartment that’s waterproof, with a roll top, like on a dry bag. 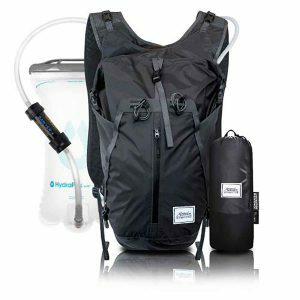 What makes it really unique, though, is that it also incorporates a 2-liter hydration bladder with a Sawyer MINI water filter attached. So you can fill the reservoir with, say, river water and immediately drink it. Available options: These have an expandable stash pocket, an inflatable back panel, and removable gear tethers. It features adjustable sternum and shoulder straps, and its custom anti-crease hose will never kink in storage. Notable: With care, this can last a lifetime. The Sawyer MINI filter removes 99.9999 percent of bacteria and protozoa from up to 100,000 gallons of water. It comes with a lifetime warranty, as does the pack itself. Whitetail hunters who sit in tree stands know all about the need for patience. Predator hunters? Not so much. The standard thinking in many places has long been that you go to a location, set up, call, wait 15 minutes, and if nothing happens, move on. That certainly works. But in areas with heavy hunting pressure, coyotes in particular can sometimes take their time responding. Maybe they narrowly escaped once before. So, at least occasionally, give spots a little more time. Call for up to 30 minutes before moving on. Now this is how to end dinner. This creamy blackberry pie recipe, from the Missouri Department of Conservation, is relatively easy to make – aside from gathering your own berries in season – and tasty. To start, place the blackberries in an unbaked pie shell. Set aside. Combine the sugar, flour and salt in a bowl, then add the eggs and sour cream, blending it all well. Spoon that over the blackberries. In another bowl, make the topping by combining a half cup each of flour and sugar. Gradually spoon in the butter and mix it until the whole concoction looks sort of like coarse cornmeal. Then, sprinkle it evenly over the pie. Finally, bake the whole thing at 350 degrees for 50 to 55 minutes, until golden brown. Garnish with additional berries and whipped cream and serve.